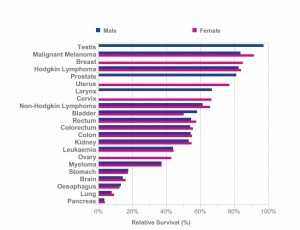 I want to remind all those that read this blog post that today 160 women will find out they have breast cancer, eight women will find out they have cervical cancer and seven men will be diagnosed with testicular cancer. It is vital that everyone finds out about the signs and symptoms of these cancers too. Please find the relevant charity details below. Today sees the launch of the UK’s very first awareness advertising campaign for pancreatic cancer, which is being shown on the London Underground stations and tube cars as well as in London and Manchester newspapers such as the Metro and Evening Standard. You will no doubt see that the campaign is a hard-hitting one and one that we feel will make people who currently know little about pancreatic cancer sit up and take notice. Some people may ask how someone could ever imagine wishing they had another cancer. Being diagnosed with cancer of any kind is devastating and no one would choose to go through a diagnosis and the treatment that follows, regardless of the type. We are also aware that all cancers can end up with a terminal diagnosis which is devastating for all involved.We would honestly not wish anyone to go through this awful disease and our heart goes out to every cancer patient and those who have lost someone. So why run this campaign? Well, when I was diagnosed with pancreatic cancer age 41 in 2007 and started to understand the gravity of the disease, only a 3% chance of survival and an average life expectancy of just months, I did feel at times that I wish I had a cancer that would give much better chance of survival; as the odds of me being around for my loved ones for longer would be significantly improved. In fact the cancer I personally wished I had was breast. This was because, while in the middle of my chemotherapy treatment, I had a call from a friend who was suffering from breast cancer. Survival for pancreatic cancer moved from only 2% to 3.5% in the same period. I get to know many pancreatic cancer patients and their families and the wish to have another cancer has been expressed many times. I spoke to a lady, who had lost her mother just 5 weeks after diagnosis, about the campaign and she told me that her mum had said ‘why didn’t I get breast cancer’ when she realised that she had such a short time left. It was important to us to ensure that we did not use models for the campaign but real patients. I am very grateful to them for being part of this. Andy, Kerry and Penny all have metastatic pancreatic cancer and not once did they hesitate in getting involved. Kerry in particular is very unwell at present and was unable to travel to London for the photo shoot, so we went to her. It was an enormous effort for her to take part in the shoot but she was determined to do it despite being exhausted by her treatment. Penny came straight to the shoot after having one of her daily doses of chemo-radiotherapy and luckily, Andy is having a break from the chemotherapy so was in good spirits. We also have not gone into this campaign lightly. When the creative agency, Team Darwin (who have kindly given their services free of charge) first showed us the advert copy there was a momentary sharp intake of breath then silence in the room when we read the full copy. Yes, the strap line is hard hitting and may even offend some but it does compel you to read on – which is what we need people to do if we are to change the fortunes for pancreatic cancer. “A lot of cancer ads rely on shock tactics. But this campaign leverages shock for information, not just emotion. So even though they`re sensational, they`re justified.” ‘How can anyone say that? Oh I see. Wow! What we want to achieve is an increased awareness of pancreatic cancer in the hope that the public are more informed about the realities of this disease that we can encourage increased funding and importantly that more people will take a trip to their doctor if they suspect they have the early symptoms of pancreatic cancer.Early diagnosis saves lives. For those diagnosed in time for potentially curative surgery, their chance of surviving five years increases ten-fold.